In game 1 of the Bellevue regional, the Antelope Valley Marauders beat the Judson Eagles 14-9. The Marauders collected 15 hits, led by Tyler Pittmon, who went 3-5 with a single and 2 home runs. Adam Maciel, went 3-4 with 3 doubles, Mikey Pereznegron went 2-4 with 2 singles, William Garcia went 1-5 with a single, Jake Harrison went 2-5 with a single and a home run, Easton Withers went 2-5 with a double and a home run and Darron Teson went 2-4 with 2 singles. The starting pitcher for Antelope Valley was Tyler Sharp, who went 6 innings, giving up 7 runs on 11 hits. The bats for the Eagles collected 12 hits and were led by Alex Galik who went 3-3 with a single and 2 doubles. Josh Kruegar went 2-3 with a single and a double, David Matthews went 2-4 with a single and a triple and Cullen Mathew went 1-5 with a double. Adam Rojas went 1-5 with a single, Andrew Siegler went 1-5 with a singlel, Conor Grove went 1-4 with a home run and Sammy Viscounti went 1-3 with a single. The pitcher for Judson was Ty Parquette who went 5 innings giving up 4 runs on 7 hits. In game 2 of the NAIA regional tournament, the USAO Drovers beat the Davenport Panthers 4-2. 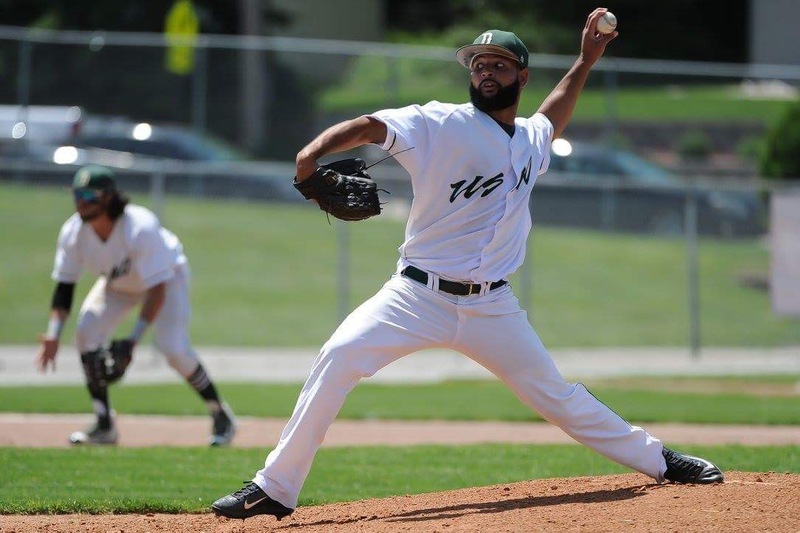 The Drovers got another impressive start from Francis Ventura who went 9 innings, giving up 2 runs on 10 hits. Ventura will move 10-1 on the season. The bats for USAO gathered 8 hits and were led by Randy Ventura who went 2-4 with a single and a home run. Frankely Gonzalez went 1-4 with a single, Christian Perez went 1-4 with a single, Dillon White went 1-2 with a single, Kenniel Rivera went 1-4 with a single, Hayden Sloane went 1-3 with a home run and Alexander Cortes went 1-3 with a double. The bats for the Panthers produced 10 hits and were led by Anthony Diponio, who went 2-5 with 2 singles. Austin Petravicius went 2-5 with a single and a double, Nolan Page went 1-4 with a single, Brian Sobieski went 1-4 with a single, Jake Bozzo went 1-3 with a single, Cameron Bair went 1-4 with a single, Jeremy Vasquez went 1-2 with a single and Matt Hoge went 1-4 with a single. In game 3 of the NAIA regional, the Bellevue Bruins beat the Antelope Valley Marauders 7-6. The bats for the Bruins gathered 16 hits and were led by Riley Baasch, who went 3-5 with a single, a double and a home run. Miles Campbell went 3-4 with 2 singles and a home run, Jake Browne went 2-4 with 2 singles, Hunter Kelly went 2-5 with a single and a double, Joe Moran went 2-5 with 2 singles, Matt Evans went 1-4 with a single, Derik Bontempo went 1-4 with a home run, Diego Iribarren went 1-5 with a triple and Brandon Salmon went 1-4 with a single. The starting pitcher for the Bruins was Todd Nicks who went 6 1/3 giving up 5 runs on 7 hits. The bats for Antelope Valley collected 12 hits and were led by Adam Maciel, who went 3-6 with 3 singles. Luke Smith went 3-5 with 2 singles and a double. Jake Harrison went 2-4 with a single and a home run. Mikey Pereznegron went 1-4 with single, Tyler Pittmon went 1-3 with a single, William Garcia went 1-5 with a single and Darron Teson went 1-2 with a single. The starting pitcher was Dallas Litscher who went 7 2/3 giving up 6 runs on 15 hits.